A food label can list a variety of strange ingredients, some of which can hardly be pronounced (and should therefore be a red flag that the contents are not good for you). But, it’s not only the ingredients on these lists that you should be concerned about. A new study warns of serious health concerns related to food packaging ingredients—those that wrap your processed foods and allow them to last for months, even years without degrading. A new paper published in the Journal of Epidemiology and Community Health indicates the synthetic chemicals in our food packages could be doing long-term damage to our health. Worst of all, the lack of research on these toxins means we simply don’t know what those damages could be. Numerous chemicals are used in food packaging—from the Bisphenol-A (BPA) that can disrupt your hormones to the formaldehyde, a known carcinogen. Generally, manufacturers are able to use these questionable materials because they are used in such small amounts, but it’s our long-term cumulative exposure to the toxins that has scientists rightfully concerned. 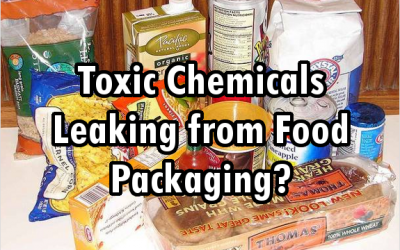 The researchers refer to these food packaging ingredients as “food contact materials” or FCMs. They say the sheer number of FCMs used should raise some concerns. 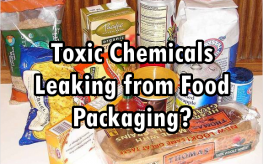 More than 4,000 chemicals are used in food packaging, with very few of them ever being proven safe. One of the difficulties in studying these chemicals and their effects on our health is that nearly every single person is believed to have already been exposed. In other words, having a “control group” with no exposure for a scientifically sound study would be nearly impossible. “Since most foods are packaged, and the entire population is likely to be exposed, it is of utmost importance that gaps in knowledge are reliably and rapidly filled,” say the researchers in calling for population-based assessments. They say such analyses are crucial to determine any possible links between these FCMs and chronic conditions like cancer, obesity, and inflammatory disorders. In the meantime, you can reduce your exposure to phthalates, BPA, formaldehyde, triclosan, and more by avoiding pre-packaged processed foods.